Whomp whomp. There're no Blood Rage (ShelfLife Exclusive)s for sale. 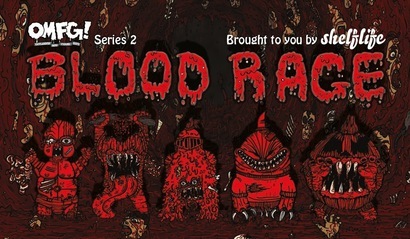 OMFG Series 2: Blood Rage was exclusive to ShelfLife.net and was released alongside the Series 1 set in mid-November 2012. Header art by Denitsa Stoykova. Blood Rage Series 2 features characters by ScruffyNerfHrdr/Charles Marsh, Andrew Scribner, Kenjitron, Jared DeCosta, and turboPISTOLA. Collectors were allowed to purchase up to 2 of each set. Bagged with header. This item will be my first item to get through Shelflife. I'm really looking forward the arrival of this artwork! :) Only drawback is that it was really hard for me to find out the available sale items on this site. If this site had an option to search ONLY available items to purchase, that would be awesome!!! Translucent "Blood Red" OMFG's how could I not! And after i stopped beimng dumb and learned how to add things to your cart here on shelf life I added these to my growing OMFG collection. Love these little guys. The BLOOD RAGE exclusive color is a translucent cherry red a little lighter shade than I thought they would be. The new series are very cool looking. Can't waut for series 3.